Heart surgery for congenitaal defects consists of a variety of surgical procedures that are performed to repair the many types of heart defects that may be present at birth and can go undiagnosed into adulthood. Heart surgery for congenital defects is performed to repair a defect, providing improved blood flow to the pulmonary and systemic circulations and better oxygen delivery to the body. Congenital heart defects that are symptomatic at birth must be treated with palliative or complete surgical repair. Defects that are not symptomatic at birth may be discovered later in life, and will be treated to relieve symptoms by palliative or complete surgical repair. Surgery is recommended for congenital heart defects that result in a lack of oxygen, a poor quality of life, or when a patient fails to thrive. Even lesions that are asymptomatic may be treated surgically to avoid additional complications later in life. Congenital heart disease is estimated to involve less than 1% of all live births. As some defects are not found until later in life, or may never be diagnosed, this number may actually be higher. Many congenital defects are often incompatible with life leading to miscarriage and stillbirths. During a child's first year of life, the most common defects that are symptomatic include ventricular septal defect (VSD), transposition of the great vessels (TGV), tetralogy of Fallot, coarctation of the aorta, and hypoplastic left heart syndrome. Premature infants have an increased presentation of VSD and patent ductus arteriosus. Diabetic mothers have infants with a higher incidence of congenital heart defects than non-diabetic mothers. 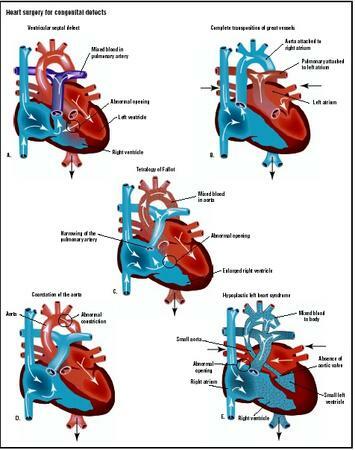 Abnormal chromosomes increase the incidence of congenital heart defects. Specific to trisomy 21 (Down syndrome), 23–56% of infants have a congenital heart defect. Surgical procedures seek to repair the defect and restore normal pulmonary and systemic circulation. Sometimes, multiple, serial surgical procedures are necessary. Many congenital defects are often associated so that the surgical procedures described may be combined for complete repair of a specific congenital defect. Repair for simple cardiac lesions can be performed in the cardiac catheterization lab. Catheterization procedures include balloon atrial septostomy and balloon valvuloplasty . Surgical procedures include arterial switch, Damus-Kaye-Stansel procedure, Fontan procedure, Ross procedure, shunt procedure, and venous switch or intra-atrial baffle. Balloon atrial septostomy and balloon valvuloplasty are cardiac catheterization procedures. Cardiac catheterization procedures can save the lives of critically ill neonates and, in some cases, eliminate or delay more invasive surgical procedures. It is expected that catheterization procedures will continue to replace more types of surgery for congenital heart defects in the future. A thin tube called a catheter is inserted into an artery or vein in the leg, groin, or arm and threaded into the area of the heart that needs repair. The patient receives a local anesthetic at the insertion site. General anesthetic or sedation may be used. BALLOON ATRIAL SEPTOSTOMY. Balloon atrial septostomy is the standard procedure for correcting transposition of the great arteries; it is sometimes used in patients with mitral, pulmonary, or tricuspid atresia. (Atresia is lack of or poor development of a structure.) Balloon atrial septostomy enlarges the atrial septal opening, which normally closes in the days following birth. A special balloon-tipped catheter is inserted into the right atrium and passed into the left atrium. The balloon is inflated in the left atrium and pulled back across the septum to create a larger opening in the atrial septum. BALLOON VALVULOPLASTY. Balloon valvuloplasty uses a balloon-tipped catheter to open a stenotic (narrowed) heart valve, improving the flow of blood through the valve. It is the procedure of choice in pulmonary stenosis and is sometimes used in aortic and mitral stenosis. A balloon is placed beyond the valve, inflated, and pulled backward across the valve. These procedures are performed under general anesthesia. Some require the use of a heart-lung machine, which takes over for the heart and lungs during the procedure, providing cardiopulmonary bypass. The heart-lung machine can cool the body to reduce the need for oxygen, allowing deep hypothermic circulatory arrest (DHCA) to be performed. DHCA benefits the surgeon by creating a bloodless surgical field. ARTERIAL SWITCH. Arterial switch is performed to correct transposition of the great vessels, where the position of the pulmonary artery and the aorta are reversed. The procedure involves connecting the aorta to the left ventricle and the pulmonary artery to the right ventricle. DAMUS-KAYE-STANSEL PROCEDURE. Transposition of the great vessels can also be corrected by the Damus-Kaye-Stansel procedure, in which the pulmonary artery is cut in two and connected to the ascending aorta and right ventricle. VENOUS SWITCH. For transposition of the great vessels, venous switch creates a tunnel inside the atria to redirect oxygen-rich blood to the right ventricle and aorta and venous blood to the left ventricle and pulmonary artery. This procedure differs from the arterial switch and Damus-Kaye-Stansel procedures in that blood flow is redirected through the heart. FONTAN PROCEDURE. For tricuspid atresia and pulmonary atresia, the Fontan procedure connects the right atrium to the pulmonary artery directly or with a conduit, and the atrial septal defect is closed. PULMONARY ARTERY BANDING. Pulmonary artery banding is narrowing the pulmonary artery with a band to reduce blood flow and pressure in the lungs. It is used for temporary repair of ventricular septal defect, atrioventricular canal defect, and tricuspid atresia. Later, the band can be removed and the defect corrected with a complete repair once the patient has grown. ROSS PROCEDURE. To correct aortic stenosis, the Ross procedure grafts the pulmonary artery to the aorta. SHUNT PROCEDURE. For tetralogy of Fallot, tricuspid atresia, or pulmonary atresia, the shunt procedure creates a passage between blood vessels, directing blood flow into the pulmonary or systemic circulations. OTHER TYPES OF SURGERY. Surgical procedures are also used to treat common congenital heart defects. To close a medium to large ventricular or atrial septal defect, it is recommended that it be sutured or covered with a Dacron patch. For patent ductus arteriosus, surgery consists of dividing the ductus into two and tying off the ends. If performed within the child's first few years, there is practically no risk associated with this operation. Surgery for coarctation of the aorta involves opening the chest wall, removing the defect, and reconnecting the ends of the aorta. If the defect is too long to be reconnected, a Dacron graft is used to replace the missing piece. Before surgery for congenital heart defects, the patient will receive a complete evaluation, which includes a physical exam, a detailed family history, a chest x ray , an electrocardiogram, an echocardiogram, and usually, cardiac catheterization. Blood tests will be performed to measure formed blood elements, electrolytes, and blood glucose. Additional tests for sickle cell and digoxin levels may be performed, if applicable. For six to eight hours before the surgery, the patient cannot eat or drink anything. After heart surgery for congenital defects, the patient goes to an intensive care unit for continued cardiac monitoring. The patient may also require continued ventilator support. Chest tubes allow blood to be drained from inside the chest as the surgical site heals. Pain medications will be continued, and the patient may remain under general anesthetic. Within 24 hours, the chest tubes and ventilation may be discontinued. Any cardiac drugs used to help the heart perform better will be adjusted appropriate with the patient's condition. For temporary procedures, additional follow-up with the physician will be required to judge timing for complete repair. In the meantime, the patient should continue to grow and thrive normally. Complete repair requires follow-up with the physician initially to judge the adequacy of repair, but thereafter will be infrequent with good prognosis. The child should be made aware of any procedure to be communicated for future medical care in adulthood. Depending on the institution and the type of congenital defect repair, many risks can be identified, including shock, congestive heart failure, lack of oxygen or too much carbon dioxide in the blood, irregular heartbeat, stroke, infection, kidney damage, lung blood clot, low blood pressure, hemorrhage, cardiac arrest, and death. These risks should not impede the surgical procedure, as death is certain without surgical treatment. Neurological dysfunction in the postoperative period occurs in as much as 25% of surgical patients. Seizures are expected in 20% of cases, but are usually limited with no long-term effects. Additional risks include blood transfusion reactions and blood-borne pathogens. Use of cardiopulmonary bypass has associated risks not related to the congenital defect repair. Procedures performed in association with cardiac catheterization have excellent long-term results, with an associated mortality of 2–4% of procedures. The Fontan procedure carries a survival rate of over 90%. Surgical procedures to repair coarctation of the aorta, in uncomplicated cases, has a risk of operative mortality from 1–2%. Alternatives are limited for this patient population. Cardiac transplant is an option, but a limited number of organ donors restrict this treatment. Ventricular-assist devices and total artificial heart technology are not yet a suitable option. Temporary procedures do allow additional growth of the patient prior to corrective surgery, allowing them to gain strength and size before treatment. "Congenital Heart Disease." In Current Medical Diagnosis and Treatment, 37th edition, edited by Stephen McPhee, et al. Stamford: Appleton & Lange, 1997. Davies, Laurie K., and Daniel G. Knauf. "Anesthetic Management for Patients with Congenital Heart Disease." In A Practical Approach to Cardiac Anesthesia, 3rd edition, edited by Frederick A. Hensley, Jr., Donal E. Martin, and Glenn P. Gravlee. Philadelphia, PA: Lippincott Williams & Wilkins, 2000. DeBakey, Michael E., and Antonio M. Gotto Jr. "Congenital Abnormalities of the Heart." In The New Living Heart. Holbrook, MA: Adams Media Corporation, 1997. Park, Myung K. Pediatric Cardiology for Practitioners, 3rd edition. St. Louis: Mosby, 1996. Hicks, George L. "Cardiac Surgery." Journal of the American College of Surgeons, 186, no. 2 (February 1998): 129–132. Rao, P. S. "Interventional Pediatric Cardiology: State of the Art and Future Directions." Pediatric Cardiology, 19 (1998): 107–124. American Heart Association. 7320 Greenville Ave., Dallas, TX 75231. (214) 373-6300. http://www.americanheart.org . Children's Health Information Network. 1561 Clark Drive, Yardley, PA 19067. (215) 493-3068. http://www.tchin.org . Congenital Heart Anomalies Support, Education & Resources, Inc. 2112 North Wilkins Road, Swanton, OH 43558. (419) 825-5575. http://www.csun.edu/~hfmth006/chaser . Texas Heart Institute. Heart Information Service. P.O. Box 20345, Houston, TX 77225-0345. http://www.tmc.edu/thi . Pediatric cardiologists and cardiac surgeons specialize in treatment of congenital defects. Hospitals dedicated to the care of children may provide cardiac surgery services. Congenital defects diagnosed at birth may require immediate transport of the infant to a facility that can provide timely treatment. What type of congenital defect has been diagnosed? What type of palliative and corrective surgical options are available, and what are the risks associated with each? Where can more information about the congenital defect and its surgical procedures be found? When will the repair be made? How many procedures of this type has the surgeon completed, and what are the surgeon-specific outcome statistics? What type of care will the child require until the repair can be made? What types of limitations are expected prior to and after the surgical procedure? What type of mental health support is provided for parents or caregivers? What type of continued care is provided for after the hospital stay? What type of financial support is available for the family and caregivers?